​Endorsement (Stamp) on the passports of British Subjects entering Burma were granted by British Consular Officials and Passport Authorities abroad. Abu Hassan Bin Kueh - Tavoy Tin Dredging Corpn., Tavoy. J.L. McCluggage Asst. Genl. Manager. Staff member, engaged from Malaya, a subject of the Federated Malay States. - 6663. Expires 23rd Mar. 1941 The passport was sent to Anglo-Burma Tin Co. by mistake and was returned by W.H. Jennings, Secy.-Acountant. Barbour M. C/o Tavoy Tin Dredging Corpn. - Burma 51404. 16th Sept. 1935 Passport renewal. Coppin Ludie, Mrs - Brit. 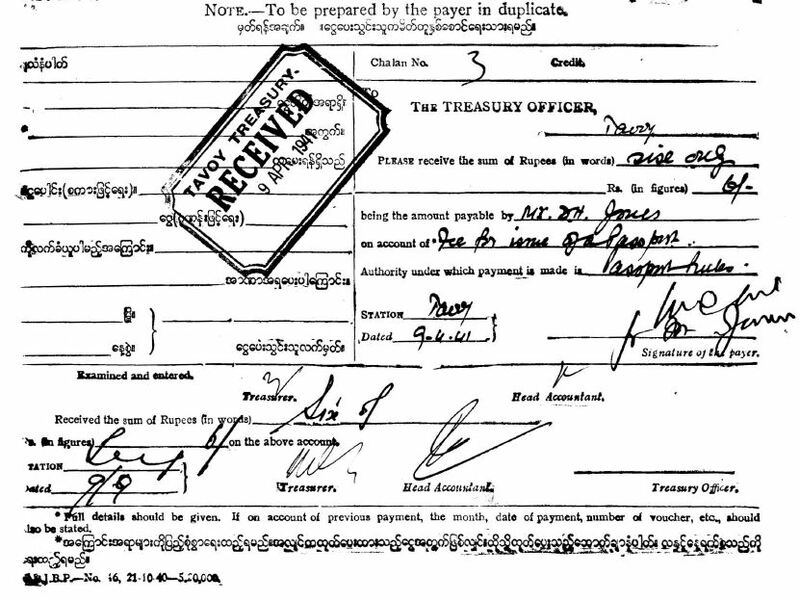 Subject proceeding to Burma Joining husband who is serving with H.M. Forces in Burma. 089268. Shanghai, 19th Dec. 1940 Endorsement granted at Shanghai. Date 24th Apr. 1941. Coutts Elaine May Kathleen, Mrs - Brit. Subject proceeding to Burma Proceeding through Burma for marriage at Tengyueh 11252. Shanghai, 18th Jan. 1935 Endorsement granted at Shanghai. Date 21st Apr. 1941. Czerski Czeslaw C/o Consolidated Tin Mines of Burma, Tavoy, to be engaged on a salary of Rs 500 per mensem. - - - Polish National. Visa Application to visit Burma. Letter signed by the Office Manager of the C.T.M. of Tavoy states they no longer require his services. Jennings W.H. Tavoy - Burma 17575. 5th Dec. 1935 His typed signed letter dated 25th July 1941 requests a renewal of his passport. Passport is now returned renewed to 4th Dec. 1945. Mr Jennings acknowledges its receipt in a typed signed letter. Johnson A. B.I.S.N. Co., Tavoy River Marine Engr. B.I.S.N. Co. Steam Launch "Yengyua" Engineer in charge England 3065. Burma, 29th Sept. 1941 Typed letter from the Deputy Commr. 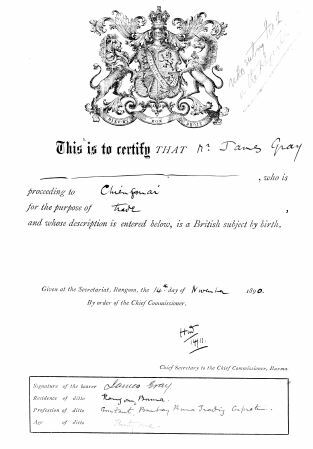 of Tavoy .. "Mr Johnson does not hold a passport and has produced his discharge book... As he may be recalled to England for admiralty duty he requires a passport..." His handwritten, signed receipt of the passport is on B.I.S.N. 's headed paper dated 20th Oct. 1941. Jones Donald H. C/o Consolidated Tin Mines of Burma, Tavoy - Return to England 23657. 31 July 1935 He is asked to specify the names of the countries he intends to visit and the expiry date of his employment contract. Joseph Dorlard - - Burma C. 102917. Jerusalem, 6th July 1939 Endorsement granted at New York. Date 1st Mar. 1941. Keat Arthur George - - Burma O4244. Hongkong, 19th June 1939 Endorsement dated 24th Nov. 1941, Kunming. Guaranteed by A. Urquhart of Jardine's, Kunming. Khoo Beng Heng - - Tin Miner (ex-store-keeper of the Tavoy Tin Dredging Corpn., Tavoy) - 84/2482. Thai Consulate, Penang 11th Dec. 1939 Visa request. Quoted L.G. Miles and W. Paxton of the Tavoy Tin Dredging Corpn., Tavoy as references. (Both are described as superior staff members.) After enquiries they have both moved from Karathuir to the Kyaukmedaung Mine. Maung Ba Shan, General Contractor of the company sends a reply and mentions Mr Dewit the present Superintendent of the Corporation. 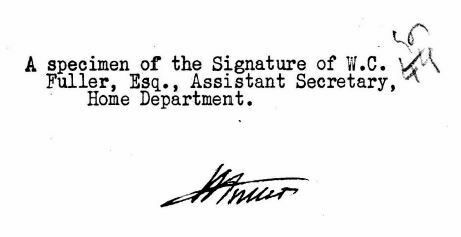 Typed, signed reply from W.J. Leal, Genl. Manager to D.R. Fishwick, Deputy Commissioner of Tavoy. Lord Horace James - - Proceeding to Burma to join H.M. Forces. Privously Secretary to Liddell Bros., Tientsin A140. Tientsin, 23rd Jan. 1934 Passport Endorsement, Shanghai, 11th Oct. 1941 He is accompanied by his wife, Mollie Beaumont (passport No. C108953, issued at Tientsin on 11th July 1941) & their 3 children, John aged 7 yrs., Claudette aged 3 yrs. & Jeremy aged 2 yrs. Lyall C. & Mrs J. Consolidated Tin Mines of Burma, Tavoy Engineer South Africa (indefinite period) en route to the U.K. 161755 22nd Oct. 1941 - Application for renewal. "... He will be returning home within a few weeks... Mrs J. Lyall's passport no. 219456 ... is also enclosed... in view of the present situation.." Nov. 1941 - passports forwarded to Home Dept., Rangoon for renewal "... will be leaving Burma in the month of January on the termination of his contract. Nair T.A.K. Bazaar Rd., Tavoy - Federated Malay States to visit his brother who is employed and settled there. - His typed signed letter dated 25th July 1941 states he is a Brit. Subject and would like to know if a passport is necessary. Reply states he does not need a passport but he should take his birth cert. or any other document which proves his nationality. Ottaway A. Consolidated Tin Mines of Burma, Tavoy - America, Dutch East Indies, U.K. and all colonies of Brit. Empire. No immediate plans, wants to preserve continuity. 13893. 13th Jan. 1931 He is asked to specify the names of the countries he intends to visit. Passport No. 2708 dated 9th Apr. 1941 is forwarded to the company and acknowledged by B.H. Stidston. Sing Thomas - - Burma 04246. Hongkong, 10th June 1939 Endorsement, dated 24th Nov. 1941, Kunming. Guaranteed by A. Urquhart of Jardine's, Kunming.